"It’s a privilege to be selected by Ernst and Young as Entrepreneur of the Year in Defense and Security"
Tenable Network Security Executives Win Prestigious Ernst and Young Entrepreneur of the Year® 2013 Maryland Award. The Maryland Cybersecurity Center (MC2) congratulates the co-founders of Tenable Network Security, Inc., who were recently announced as winners of the Ernst and Young Entrepreneur of the Year® 2013 Award for the Maryland region. Ron Gula, CEO; Jack Huffard, President, and COO; and Renaud Deraison, Chief Research Officer were named as co-recipients of the award in Defense and Security among winners across 11 categories. Winners were announced on June 26, 2013. "It’s a privilege to be selected by Ernst and Young as Entrepreneur of the Year in Defense and Security" says Ron Gula, CEO and Co-founder, Tenable Network Security. Gula, Huffard, and Deraison will proceed with the other regional winners to compete for the Ernst and Young National Entrepreneur of the Year 2013 award. 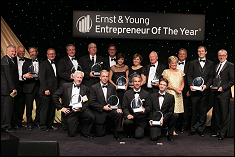 Winners in several national categories, including the National Ernst and Young Entrepreneur of the Year Overall Award winner will be announced at the annual award gala, held in Palm Springs, California, on November 16, 2013. Tenable has a longstanding relationship with the Maryland Cybersecurity Center. As a corporate partner, Tenable has participated in technical research exchanges, delivered lectures and technical talks to UMD students, and hosted MC2 faculty at Tenable offices for research collaborations. In addition, Ron Gula, CEO and Co-founder, is a member of the MC2 External Advisory Board. MC2 congratulates Tenable on this impressive achievement.